Synthetic peptide within Human Dexras1 aa 247-278 (C terminal) conjugated to Keyhole Limpet Haemocyanin (KLH). The exact sequence is proprietary. 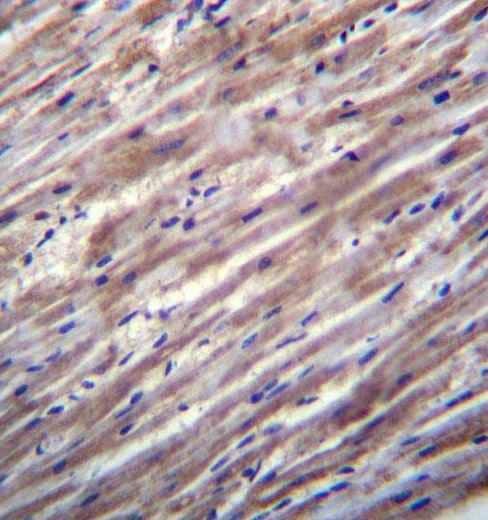 Mouse liver tissue lysate; Human heart tissue. ab171370 is purified through a Protein A column, followed by peptide affinity purification. Our Abpromise guarantee covers the use of ab171370 in the following tested applications. Small GTPase. Negatively regulates the transcription regulation activity of the APBB1/FE65-APP complex via its interaction with APBB1/FE65. Expressed in a variety of tissues including heart, cardiovascular tissues, brain, placenta, lung, liver, skeletal muscle, kidney, pancreas, gastrointestinal and reproductive tissues. Belongs to the small GTPase superfamily. RasD family. S-nitrosylation stimulates guanine-nucleotide exchange activity. Cell membrane. Cytoplasm > perinuclear region. Nucleus. Immunohistochemical analysis of formalin-fixed, paraffin-embedded Human heart tissue labeling Dexras1 with ab171370 at 1/10 dilution, followed by peroxidase conjugation of the secondary antibody and DAB staining. Publishing research using ab171370? Please let us know so that we can cite the reference in this datasheet. There are currently no Customer reviews or Questions for ab171370.